Merseyside Police are investigating an incident which occurred during Liverpool’s win over Chelsea at Anfield on Sunday. The Reds secured a 2-0 win over their rivals in what was a crunch encounter for Jurgen Klopp’s men in relation to the Premier League title race. The win lifted them back into top spot in the table, two points clear of title rivals Manchester City, albeit Pep Guardiola’s side have a game in hand. Nevertheless, as noted by BBC Sport, police and the FA are now looking into an incident which happened after Sadio Mane opened the scoring in the showdown. 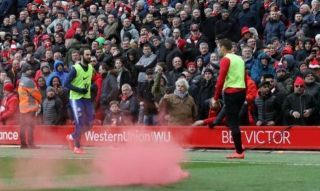 It’s claimed that a flare was thrown from the top tier of the Anfield Road End and it landed on the Chelsea fans below them, with a nine-year-old requiring medical treatment as a result after suffering a panic attack. It’s stressed in the official statement from the Merseyside Police that the investigation is ongoing, and they will naturally now look at footage inside the stadium during the game to get a clearer picture of what happened. It’s an unsavoury story though which sours what was a thrilling encounter given what was at stake for both sides as Chelsea continue to scrap for a top-four finish to secure Champions League qualification for next season. However, after a spate of incidents involving supporters in recent weeks, this now appears to be a rather serious matter given the involvement of both the police and FA, with the fan in question who threw the flare now potentially in hot water, as well as Liverpool if the FA consider them at fault for not preventing the flare being taken into the stadium.